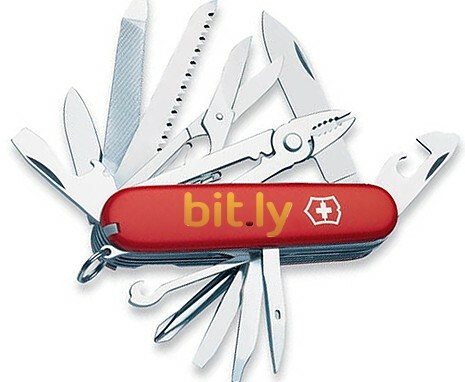 Do you use bit.ly for link shortening? You may be. But you can directly share the shortened url to various social networking sites like Twitter and Facebook and track the number of clicks and more statistics. More you can create your own custom short URL using your own domain with the help of bit.ly service. The setup is simple and gives you great flexibility. That's not the only use. You can also allow other custom URL shortening services like dilvr.it . it to use your bit.ly account and use the custom domain shortened links by providing the bit.ly api key. But this is not all. You can use it as one more tool. If you are already using services like 'Read It Later', you may consider to use the Bitly to replace it. This is a small extension for browsers like Firefox and Chrome. You have to open account at Read It Later website and whenever you are browsing the internet and find any interesting topic or web page but do not have time to go through the complete article, you can mark the webpage with just one click and the url of the page will be saved to your 'Read It Later' account server. Whenever you get time, you can access the reading list from any browser. Its great tool that save your time and never loose any interesting article on the web. Why you should consider to switch? You can also use the same shortener at various other services and can automatically share the links to social media. While marking any page in your reading list, you can add custom notes for more information and create as many groups as you want for managing the lists better. Drag and drop the +Bitmark button to your bookmark bar. Its just simple bookmarklet that will allow you to easily add any web page to your bet. ly account for reading list. If you are using Google Chrome, you can directly install the Chrome extension. Once you drag and drop the bitmark bookmarklet to bookmark bar or installed the extension, you have completed the installation. Browse to any web page you want and if you want to save the page URL for further reference or you want to read it later, click on the Bitmark you saved on the bookmark bar. Clicking on bitmark button will open a small pop-up. Here you can add a note so you for your better understanding. Here if you want to share the page or link, you can make the link public by deselecting 'Private' option. You can go to settings by clicking on the settings button at the lower right corner. In settings if you select 'One click save and shorter' option, you will be not prompted to add notes to the saved URL. Just one click on bitmark button will save the webpage directly to your bit.ly account. Click on 'Save Bitmark' and you get more options like 'Make the link public', creating custom short url, add to bundle, statistics about the saved link like number of shares, safes etc. Making the link public will allow other to find the link you have saved. But using custom short url options, you can create custom extension for the shortened link. Add to bundle option is a great way to organize your saved links in many groups by making the appropriate bundles. Clicking on share button will allow you to share the link and note to social media like Facebook and Twitter. The thing to note here is, you can add as many Twitter account you want if you have multiple Twitter accounts. Same is the case with Facebook. So you can easily update all your Twitter and Facebook accounts at a time making it easy to publicize your webpage and your blog. You can also send the webpage URL as email to anyone. Do you have any more uses of bit.ly? Please let me know. Reply and Share the post if you like it.